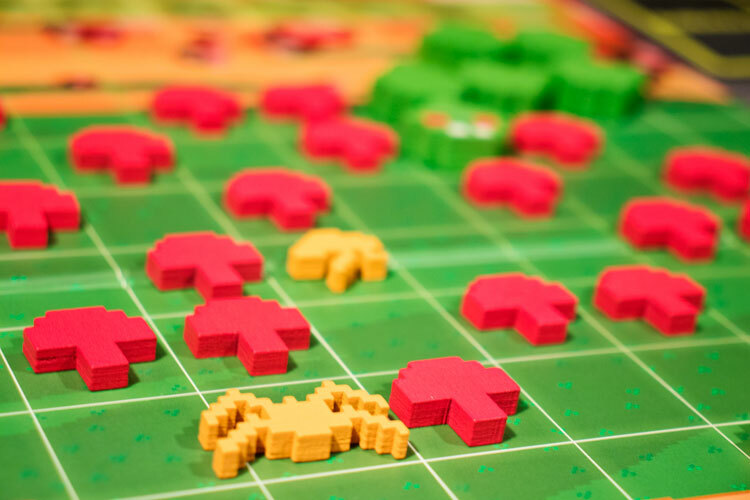 We review Atari’s Centipede, a 2 player asymmetrical board game published by IDW Games. Centipede is a fast paced and fun asymmetrical game that simulates the classic 80s arcade game that pits Gnome versus Bug. If you read my Pew-Pew-review, you know I grew up in the eighties and spent a good deal of time in the warm glow of the video game arcade. Back in the day, I was drawn to Centipede because it used what was known as the trackball instead of the classic joystick. You could spin the trackball fast for speed or move it slow for precision, which was a perfect fit for this gnome against a bug game. 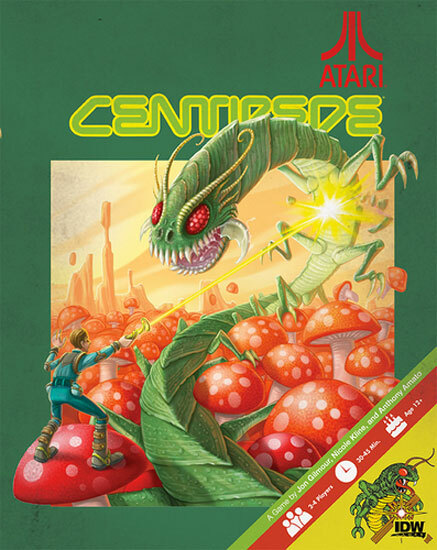 This nostalgic jaunt brings us to today’s review, Atari’s Centipede from IDW Games. I have high hopes for this one and I will be ok without the use of a trackball for this review. 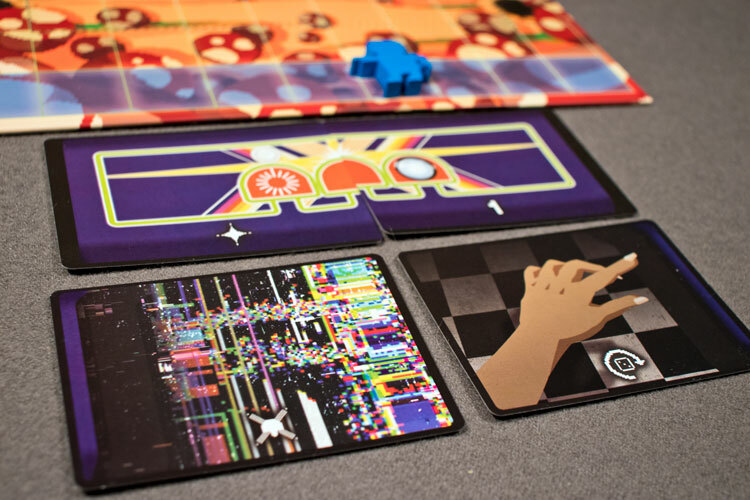 Centipede is an asymmetrical game for 2-4 players and is best with 2 players and plays in about 30 minutes. The action die selected will determine what actions the gnome player can take. 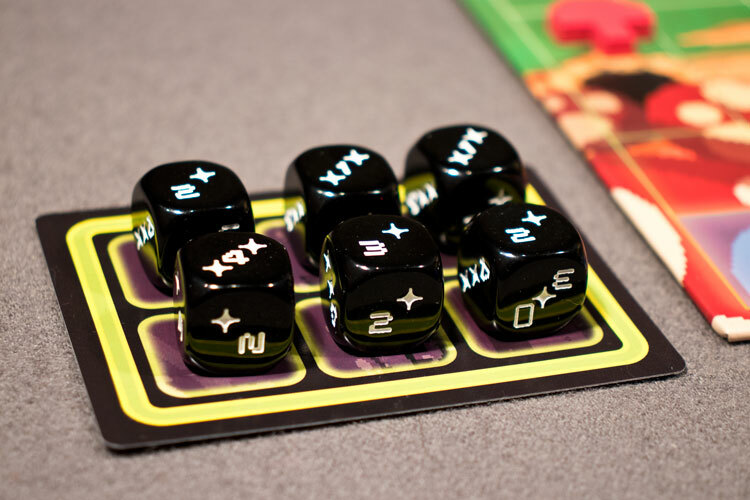 The actions on the dice range from move, fire, and recharge 1 Gnome Control card. The Gnome moves from side to side based on the number on the die. When the Gnome fires, if a Mushroom is hit it’s removed. If a Flea, Spider, or Centipede segment is hit, it’s removed but then replaced with a Mushroom. The Gnome Control cards allow you to fine-tune the Gnome actions and, once used, need to be recharged before they can be used again. The Gnome Player wins when the last Centipede segment is removed from the game board. 1. Play a Card: Play 1 card from your hand, taking the card action. 2. Move your bugs: Move the Centipede, Spider, or Flea, if on the game board. Each has its own movement rules. 3. Draw a Card: Draw 1 card from the Centipede deck. If any bug moves into the space above the Gnome, it eats the Gnome and the Centipede player wins. The bugs move just like their video game counterparts. IDW did a get job emulating the 80s Arcade look and feel for Atari’s Centipede. The game box actually reminds me of the old cartridge games of the 80s and the game pieces resemble bit graphics of the classic game. 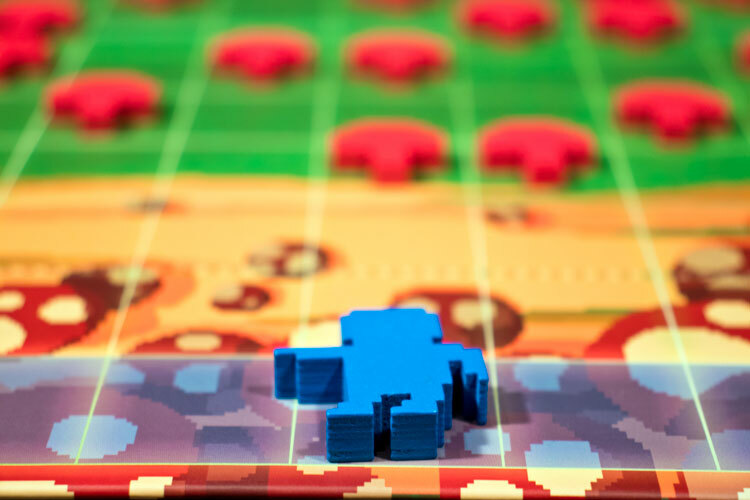 The Bug game piece’s movement also closely mirrors the classic arcade game to a tee. Overall, great job from IDW bringing the classic 80s game to life on the tabletop. The gnome player has some special cards they can use once before they need to be recharged. Now, much like the original Centipede Arcade game, the Gnome player never wins, you only played to get the top score and add your initials to the game top ten player list. The same can be said for Atari’s Centipede. In the multiple plays, the Gnome player didn’t win and, for others I polled, the same is true. I think a thicker Centipede deck without adding Spawn cards might help. Overall, this could discourage some players from playing or possibly motivate others to continue to try to win as the Gnome player. The Gnome player might not give you the victories you seek, but the Control Cards give nice player options. 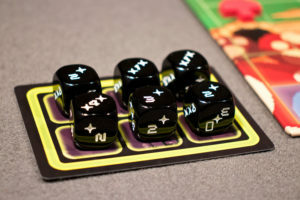 Instead of simply moving and shooting with most of the dice pool actions, the player can enhance their movement, shooting, refresh the die pool, or remove mushrooms. Plus, if you don’t use any cards on your turn, you get a free control card recharge. 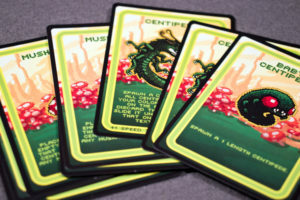 The Centipede’s action deck will give the player a variety of special abilities. As I mentioned above, I love the bug movement because it’s so close to the 80s arcade that I adore. The only drawback is that depending on Centipede cards played, the Gnome shooting your segments, and Mushrooms in your way, the movement can feel complicated at times and slow the usually fast pace of the game. I know they are trying to emulate this classic game, but the Centipede player does need to really pay attention to accurately follow the movement rules. Most of the game, aside from the Centipede movement at times, is fast paced much like the video game (not as fast, but close). Turns will go quick and there’s next to no downtime. I think most gamers will appreciate that as this is a light game. The only other aspect that can be viewed as a negative is, much like the classic arcade game, Atari’s Centipede will eventually feel repetitive. If you play either the Gnome or the Centipede, you might hit a wall and the game will not really feel too much different from the last. I hesitate to say that this game needs an expansion because that could change that arcade feeling I do enjoy. Just be warned that this could be an issue for you. The centipede player must get a bug to a space directly above the gnome to win. IDW did an outstanding job emulating eighties arcade game experience with Atari’s Centipede. From the design of the pieces to the bug movements, everything feels right at home. While most Gnome players are still looking for that elusive win, the Control Cards give great player options. Even though the Centipede movement can feel complicated and slow some turns down, the game is fast-paced with little downtime. I understand that Centipede is IDWs first Atari game release and that Missile Command and Asteroids are to come. If those emulate the same 80s Arcade feel as Atari’s Centipede, I can’t wait to play get my hands on them. 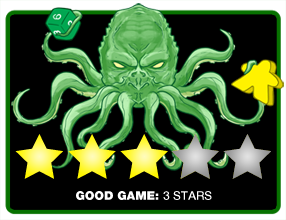 Final Score: 3.0 Stars – A great fast-paced and fun asymmetrical game that simulates the classic 80s arcade game.